Don’t Just Train…Wage WAR with our Powerful Preworkout Supplement! 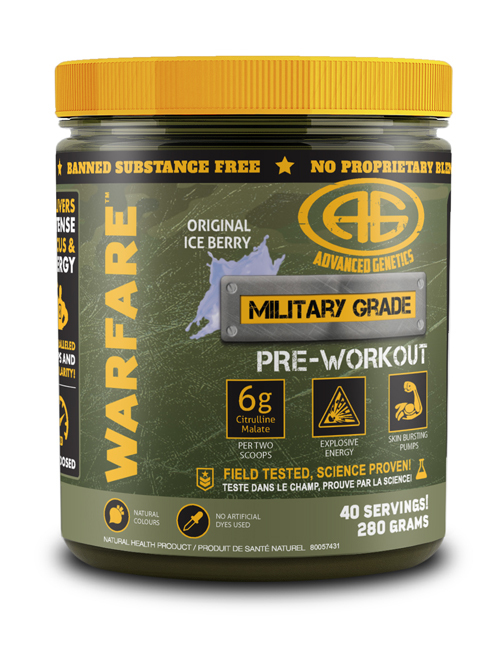 Warfare is taken 30 minutes pre-workout (2 scoops for maximum results). Access your tolerance with 1 scoop. Citrulline Malate – increases nitric oxide, the cell-signaling molecule that regulates blood flow, oxygen delivery, glucose uptake, muscle firepower, and muscle growth! Citrulline malate also reduces lactic acid and ammonia, and increases ATP and phosphocreatine recovery. 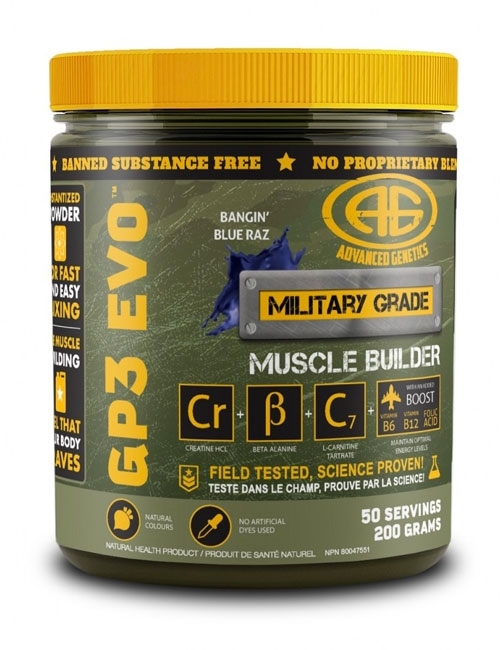 6 full grams per 2 scoops – the most in the industry and the amount shown in human studies to produce maximum effects. 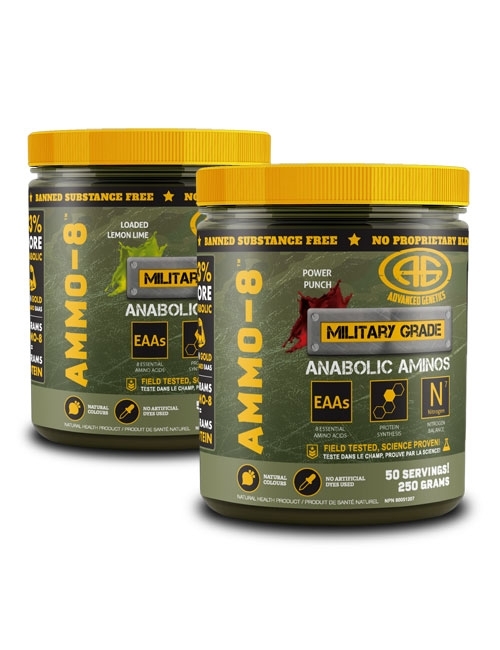 Betaine Anhydrous – shown to increase muscle strength and power, increase protein synthesis and creatine production in the body. One human study showed an increase of 4 pounds of lean muscle (arm size by 10%) and a decrease of 7 pounds of fat using the same dose available in 2 scoops of Warfare! Tyrosine – improves alertness and cognitive performance. Tyrosine also maximizes body composition, prevents overtraining and reduces mental fatigue. Vitamin C – the antioxidant effects of vitamin C protect nitric oxide by preventing free radicals from degrading it. Vitamin C also has numerous health benefits such as producing healthy cells, speeding wound healing, improving iron absorption, and aiding in the production of collagen (supporting skin, connective tissue and blood vessels). Caffeine/Dendrobium/Citrus Reticula/Schisandra Chinesis/Synephrine – elevates epinephrine/adrenaline, dopamine and serotonin creating laser-like focus, intense energy and heightened mood and awareness. When do I take WARFARE™? Powder: For maximum results, on training days we suggest 1-2 scoops 30 minutes before training. 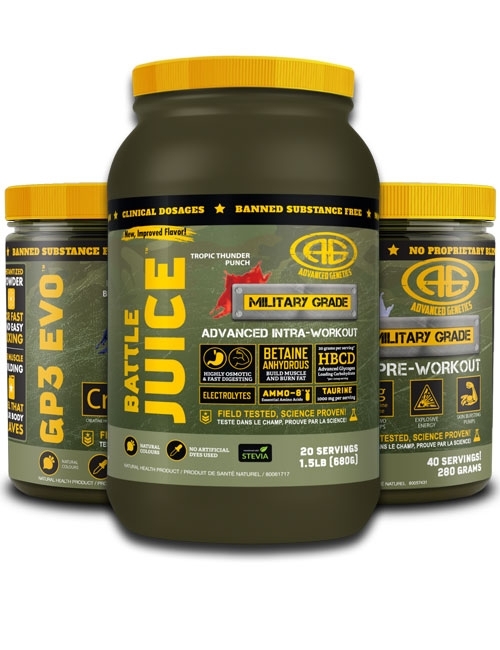 You can combine Warfare with GP3 EVO and Battle Juice for maximum effectiveness. Do I have to take Warfare on non-workout days? Do I need to cycle Warfare? It’s always a good idea to cycle stimulants. You can cycle with F-10 or Flash Bang. Is there anything illegal in Warfare? 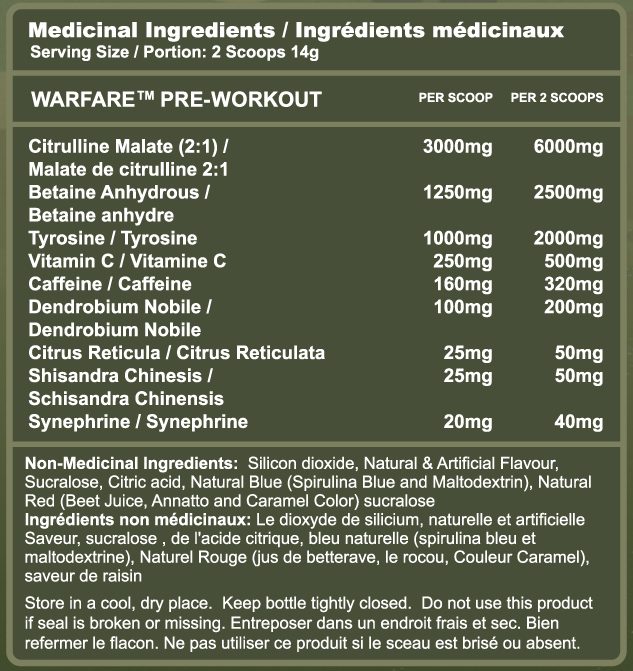 It may feel like it, but Warfare has been granted an NPN (natural product number) from Health Canada. Always check with your federation’s list of banned substances if you compete in tested events. 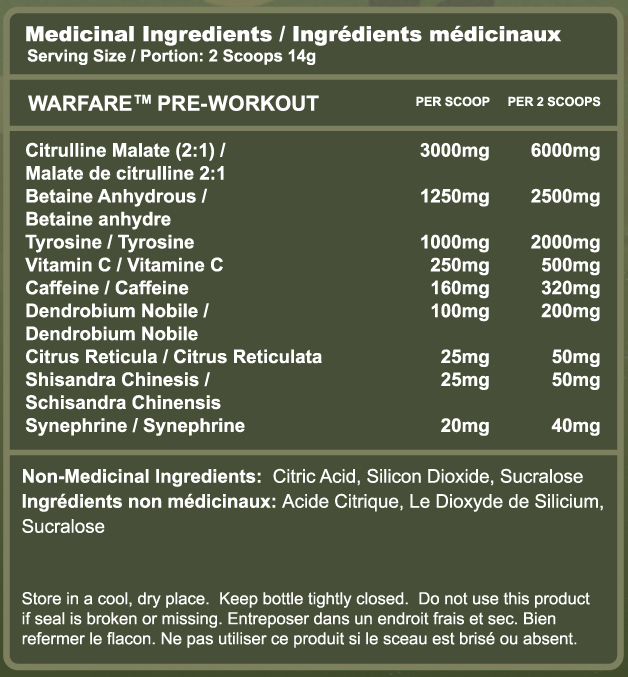 What makes Warfare better than other pre-workouts? Most pre-workouts are stimulant based. Occasionally they will also deliver a good nitric oxide system (but usually are extremely under dosed!). 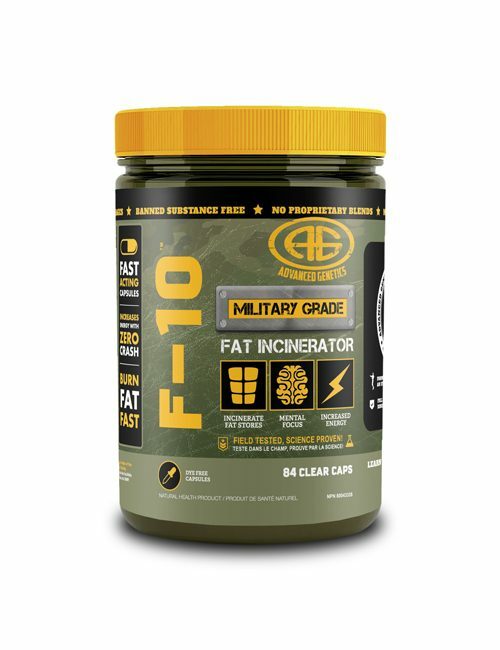 Warfare is the first to deliver real ingredients with full dosages to truly deliver a great stim and nitric oxide effect…and it actually BUILDS MUSCLE! 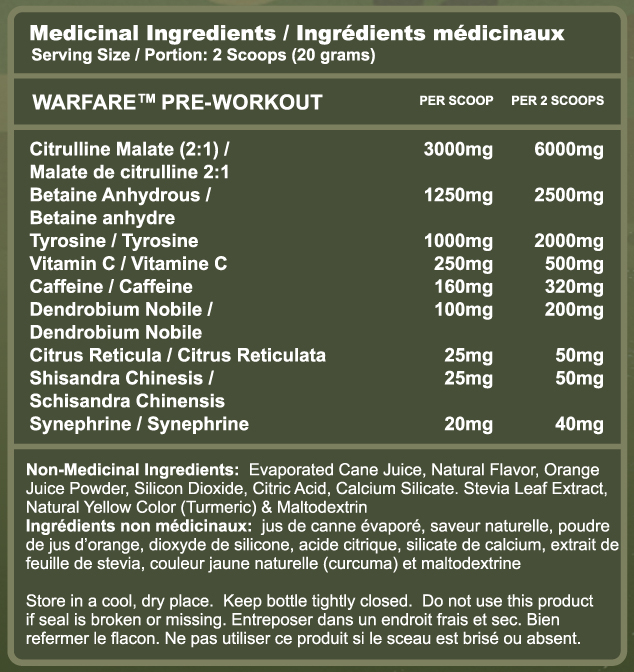 Warfare is a powerful preworkout supplement for athletes. Was Warfare originally blue raspberry? Yes, it was. However the natural coloring we used reacted with other ingredients in the powder and turned the color of the drink green. We removed the coloring completely and renamed it. It is the exact same flavor and formula as the original…thus the name “Original Ice Berry”. amazing energy and focus!! Love this!! Amazing energy, pumps, focus and no crash. This pre isn’t missing anything. 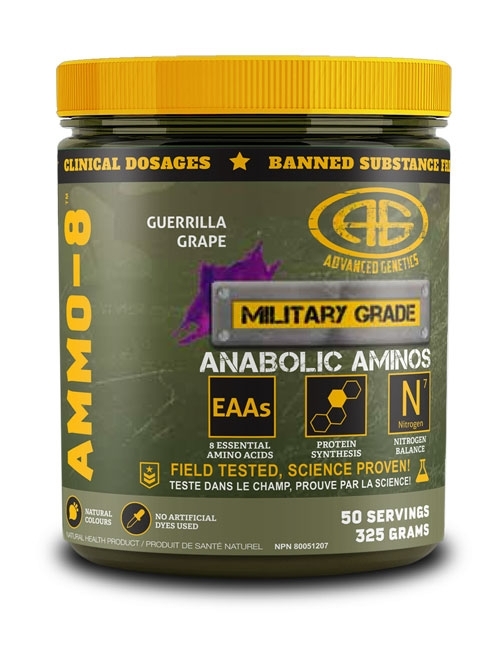 I’m so thankful that AG came out with a great tasting flavoured/powered preworkout. I’ve tried all of the flavours. I have to say that Guerrilla Grape is my favourite! This preworkout blends so nicely and not clumpy at all. I def feel like my workouts are greatly improved whenever I take Warfare! Thanks for making this AG!